My second summit of the Saturday was Mount Rouse, VK3/ VS-048, which is situated near the little town of Penshurst, and about 275 km west of Melbourne. 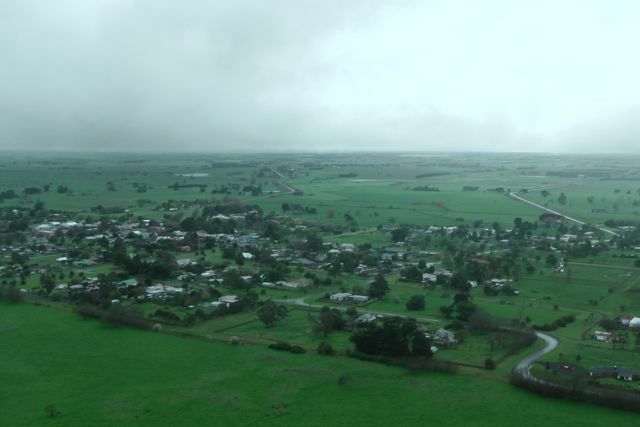 Penshurst is just a small town with a population of about 500 people, and is the centre of a large dairying, agricultural and pastoral district. The town is situated near the foot of Mount Rouse, which is an extinct volcanoe. It was about a 35 km drive from my previous activation at Mt Napier. 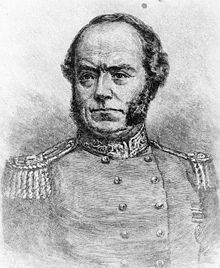 Mount Rouse was named after the Colonial Under Secretary of New South Wales. The summit was known as ‘Collorer‘ by the local Nareeb Nareeb and Kolor Aborigines. The local aboriginal tribes gathered food from the local area and fresh water from nearby natural springs and creeks. The Kolor aboriginals built substantial huts for their shelter in the winter, preferring the open countryside in the warmer months. A man called John Cox was the first settler to take up land at Mount Rouse, and he established a sheep station by 1840. There were also others that held leases on land in the surrounding district, and the local aboriginals soon found their food sources destroyed or driven out by clearing and the introduction of European stock. During times of necessity they turned to the Europeans stock for food. As a result they found themselves subject to retaliatory raids by white landowners and there were numerous episodes of killing and bloodshed. Due to the decline in the Aboriginal population the New South Wales Government established a number of reservations. Mount Rouse was chosen as one of those. As a result John Cox was forced to remove his stock from the land and an Aboriginal Protectorate was opened. Despite this, conflict continued and diseases introduced into Australia by Europeans ravaged the indigenous peoples. Thus, within a few years, the Aboriginal population was so diminished that the reserve closed. Mount Rouse is a massive accumulation of scoria rising 100 m above the surrounding volcanic plain. It is worth 1 SOTA point. It is built mainly of red and brown scoria with thin interbedded basalt lava flows. The scoria forms an arcuate mound opening towards the south-west and giving the appearance of a breached cone. To the south of the main scoria cone is a deep circular crater with a small lake and a smaller shallow crater rimmed with basalt. The scoria is the youngest element of an eruption point that produced the longest lava flows known in the Newer Volcanics Province in Victoria. The flows followed shallow, gently sloping river courses and eventually united to extend at least 60 km south of Mount Rouse. A thin basalt lava flow contained in the scoria cone has been dated at approximately 1.8 million years, conflicting with dates of only 0.3 to 0.45 million years obtained from the end of the Mount Rouse flows near Port Fairy 60 km to the south. The scoria cone is the highest relief in the area and is an important vantage point to view the lavas and adjacent volcanoes of Mount Eccles and Mount Napier. Unfortunately quarrying has removed a significant portion of the scoria and has left large pits that visiually detract from the overall beauty of the summit. Tree planting has obscured some of the geological features, such as the crater within the big scoria cone. Upon arrival at the summit it was very wet. The weather was really threatening with regular showers which at times were quite heavy. But fortunately I did not have to walk far to get to the summit, and retreat back to the car if required. I put on the back pack and I then walked up the stairs to the summit, and set up my gear in a hurry to try to avoid the weather. Initially the summit was completely fogged in and I really couldn’t see any views at all. But the weather slowyl cleared a little bit and was able to see the little town of Penshurst just below the summit. 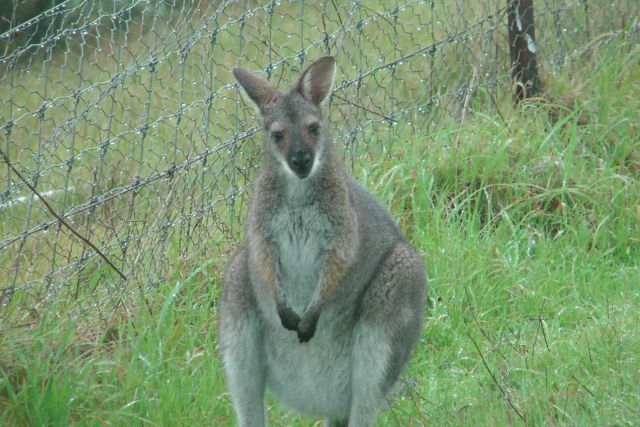 Whilst I set up the gear I was carefully watched by 2 little euros (wallabies) who appeared to be very tame, and quite often came up within only 5 metres. 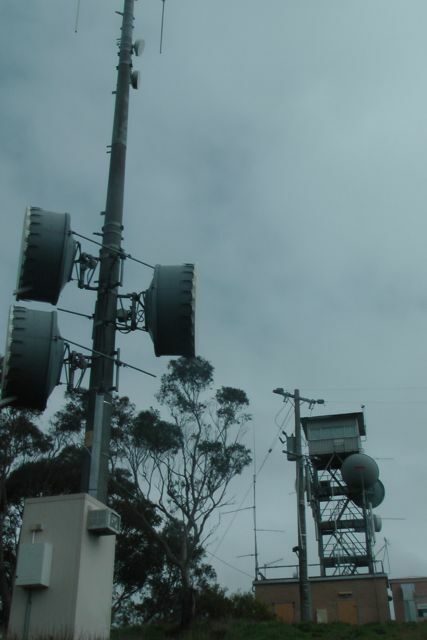 There is a communications tower at the summit and also a fire spotting tower. I was a little concerned with the towers and the possibility of noise, but once I had turned the radio on I was pleasantly surprised. The noise floor was very low. There was a strategically placed wooden bench on the summit in close proximity to the trig point and this was obviously the pick of the operating positions. Not only did I use the bench to sit on, but I also attached the 7m squid pole to the bench using some octopus straps. My first contact on the summit was with Col VK5HCF who had his usual strong qrp signal, and this was followed by Peter VK3PF who was mobile. 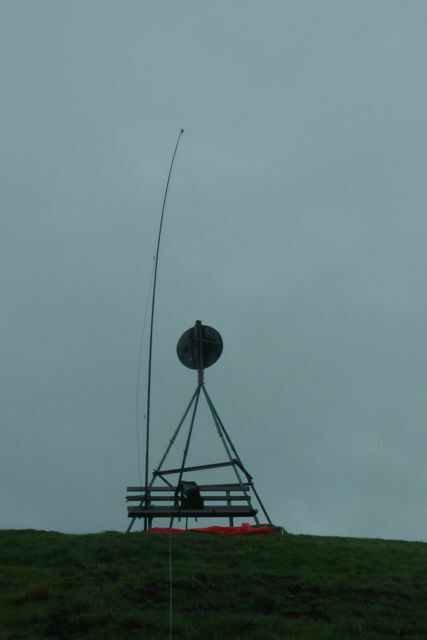 My 3rd contact of the summit was a ‘Summit to Summit’ QSO with Glen VK3YY who was portable on Federation Range. By contacting Glen I had tipped over the 250 point mark for the Summit to Summit certificate. My 4th qualifying QSO was with Andy VK5LA in the SA Riverland with a very strong 5/9 signal. It was about this point that the showers started to get a bit heavier, so I grabbed the bothy bag and climbed inside to stay dry. 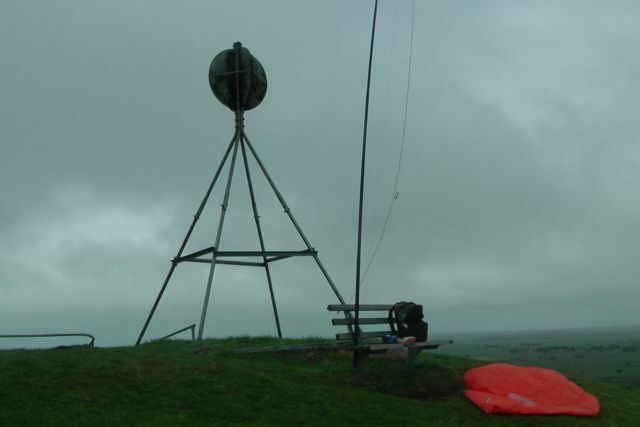 Due to the weather I only stayed on the summit for 30 minutes, but in that time I managed 16 QSO’s on 40m SSB into VK1, VK2, VK3, & VK5. Only 2 qrp stations called in this time around. Andrew VK3ARR who was becoming a regular qrp caller (5/4 sent and 5/5 received), and Andrew VK2UH who was qrp with just 5 watts (5/8 both ways). Col VK5HCF; Peter Vk3PF/m; Glen VK3YY/p; Andy VK5LA; Matt VK1MA/m; Tony VK3CAT; Tim VK5AV; Warren VK3BYD; ANdrew VK3ARR/qrp; Bernard VK3AMB; Peter VK3FPSR; Rhett VK3GHZ; ANdrew VK2UH/qrp; Ron VK3AFW; Brian VK3MCD; and Mark VK7FMPR.